How to Do Everything with PHP & MySQL has been designed as a comprehensive tutorial that will teach developers everything they need to know to begin creating database-backed Web applications. 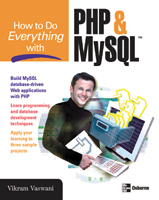 It contains information on both the PHP programming toolkit and the MySQL RDBMS (including coverage of relevant features in both PHP 5.x and MySQL 4.1.x), and provides one-stop coverage of software installation, language syntax and data structures, flow control routines, built-in functions, and best practices. How to Do Everything with PHP & MySQL is targeted at novice Web developers interesting in server-side scripting and database usage. Such developers are typically already familiar with HTML, CSS and client-side scripting, and are keen to add server-side programming skills to their repertoire. The PHP-MySQL combination is one of the most popular for server-side application development, and this book provides an easy introduction to using it. Every chapter in How to Do Everything with PHP & MySQL contains code snippets and examples that you can try out yourself. The concepts taught in each of the main sections are further illustrated with a sample application at the end of each section; this sample application is a practical tool, such as a Web-based shopping cart or a news publishing system, that you can immediately use and modify for your Web site. © Melonfire, 2005. all rights reserved.